Award Winning UMass Dining is known for its extremely strong culinary program, professional customer service and can-do attitude, but not without the tireless efforts of our management team, students and culinary workers. Meet the team that make UMass Dining shine bright everyday! 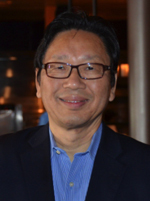 Ken Toong is the Executive Director of Auxiliary Enterprises, which is comprised of UMass Dining, Hotel UMass, UMass Conference Services, Licensing, UMass Catering, University Club & Restaurant, as well as the University Bookstore. Auxiliary Enterprises provides the core service that support the academic and extracurricular goals of the university. Ken always puts customer service first and is committed to going beyond simply providing services by creating a unique experience for all customers and visitors. An avid supporter of student health and regional food system, Ken places a strong focus on sustainability, nutrition and community. In his free time, Ken enjoys jogging, reading, traveling, walking the dog, and rooting on the Dallas Cowboys and UMass Minutemen. Garett Distefano is the Director of Residential Dining. His position entails overseeing all residential dining commons and the UMass Bake Shop. Garett assures that all dining commons are running efficiently and effectively while producing high quality food. Garett takes pride in the food served by the residential dining commons, but notes that there is always room for improvement. While his background is in investment banking, Garett switched to food services when he found the values on Wall Street didn’t match that of his family restaurant growing up. Outside of the office, Garett is a family man, raising two daughters with his wife whom he has known since the sixth grade. As Director of Finance, Claudia Brown contributes to the overall success of Auxiliary Enterprises by managing all financial functions for the organization. Reporting, budgeting, accounting and analysis, accounts payable, accounts receivable, the Business Office and Meal Plan Office, Project Management and Cash Management are some of the areas within the department of Finance. "I love problem solving and strategizing with team members in setting goals and in resolving financial concerns. Numbers can paint a very clear picture. It’s very gratifying to assist our operations through the analysis of data." Outside of work, Claudia enjoys living on a small farm and getting together with family and friends. Christopher began his career at the University of Massachusetts during his senior year working in the Purchasing department as a staff assistant. He was able to work his way up to Director of Purchasing and now oversees the procurement operation for all of Auxiliary Enterprises and its yearly budget of over 33 million dollars. Throughout his tenure at the University, Christopher has developed a strong rapport with local farmers and suppliers continuing the department’s strong tradition of local sourcing and outreach. 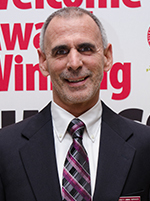 In addition, he manages all marketing initiatives for Auxiliary Enterprises and its associated brands including its strongest and most influential brand, UMass Dining. Great story telling is one of the most critical elements to any marketing department’s success and at UMass this is no different. Together with his creative team, Christopher focuses on the successes within Auxiliary Enterprises to focus further attention on the great things that are happening at the University. Through compelling storytelling and a great customer experience, UMass Dining has grown to become one of the most recognized and admired College and University Dining Program in America. Christopher is an alumnus of the University of Massachusetts twice over with a Bachelor of Science in Animal Science (2003) and a Masters in Business Administration (2008). He resides in Auburn MA, with his wife (also a graduate of UMass Amherst) and their 4 year old daughter. 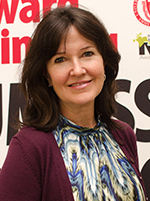 Kathy oversees all sustainability initiatives for Auxiliary Enterprises. She focuses on including sustainability in everyday decision making for the division, aligning efforts with the campus wide sustainability priorities, and building diverse partnerships. Kathy has extensive experience in building multi-sector collaborations, leading community engagement strategies, and strategic planning for a variety of food systems initiatives. She has a Master of Public Health from UMass Amherst and a Bachelor Degree from Smith College as an Ada Comstock Scholar. Kathy enjoys gathering family and friends to cook together using local ingredients year round. She also enjoys practicing mindfulness meditation and supporting local music. Dianne Sutherland is the Senior Dietitian at UMass. 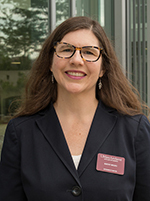 Her main responsibilities include nutrient analysis of all the dining commons recipes, entering and modifying ingredients and recipes, working with SPE to make healthy meals available to students, overseeing the nutrition education program, and mentoring undergraduate nutrition majors and dietetic interns. 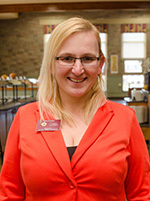 Using her personal experiences, she is able to connect with students with special dietary needs and their families making it possible to get a nutrient rich meal and never leaving the dining commons hungry. Outside of work she enjoys spending time with her family, cooking, baking, and helping with her teenage daughter's sports and band activities. Marlene Navarro is the Assistant Marketing & Communication Manager of Auxiliary Enterprises. With a degree in Communications and Public Relations from CSUS, Marlene comes to us originally from Sacramento, California. She has worked with marketing and advertising agencies on projects that varied from water, transportation and public health issues to education, destination and foodservice marketing. Leading the Marketing Intern program here at UMass Dining, she will continue to work diligently with our AE Director team, assist in managing marketing communications, and develop strong community partnerships on and off campus. Martha Monaghan is the Special Events Manager at UMass Dining. She is responsible for bringing in guest chefs, and running promotions and special events. Her events promote healthy, sustainable, local food, and teach students the importance of healthy eating. In order to keep the food at an award-winning level, she leads a team of 24 student ambassadors that provide feedback to the program. While working at UMass for 8 years, she has made great relationships with many students and loves seeing students enjoy the food and events offered at UMass. When she is home she loves gardening, vacationing in the Cape, and trying new recipes. 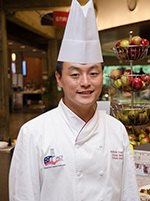 In 2000, Anthony became part of the UMass culinary staff at Hampshire Dining Commons, starting at the bottom, and progressing to the position of Sous Chef. In 2006, Anthony became the Chef of the newly renovated, 14 million dollar Berkshire Dining Commons. In 2013, Anthony was transferred back to Hampshire DC after its 16 Million dollar remodel. Anthony looked forward to the challenges of opening Hampshire DC with its strong emphasis on local, sustainable, and world cuisines. In 2014, Anthony was promoted to Chef de Cuisine, overseeing both Worcester and Franklin DC on the north side of the UMass campus. Not wanting to leave unfinished business, in 2013, Anthony reenrolled at UMass, and is poised to graduate May 2015 with a HTM degree and is completing a five (college level) course sustainability certificate. Anthony has the distinction of being a ACF Certified Executive Chef, 2008 National NACUFS Culinary Challenge Champion, 10 time ACF Gold Medalist, 3 time Northeast Regional Champion, five time UMass Culinary Team Captain, 3 time “Taste of the World” Team Champions, current culinary chair for the NACUFS Northeast Regional Culinary Challenge, and 2014 first place International Student Iron Chef Coach. In his limited free time, Anthony enjoys spending time with his family, fly fishing, golf, and cooking for his girlfriend. 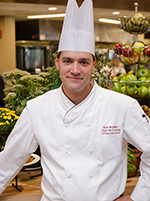 Bob Bankert is the Chef de Cuisine at UMass Dining. He oversees all culinary operations at both Hampshire and Berkshire Dining Commons and takes pride in keeping menus fresh and in season. Bob is originally from New York, and grew up in his family’s restaurant. Through this, the love of cooking was instilled in him at a very young age, and inspired him to attend the New England Culinary Institute where he earned a BA in Food & Beverage Management. Since coming to UMass in April, 2014 Bob has been responsible for monitoring recipes, production, and food cost. When he isn’t in the DCs you can find Bob running, traveling, brewing beer at home, and spending time with his family. Timothy Woods is the interim manager of the Worcester Dining Commons, He is responsible for the overall operation at Worcester ensuring every meal is executed properly each day. Tim enjoys training new staff members, working closely with employee to serve our customers on a daily basis and interacting with students who dine within the facility. With more than 16 years of foodservice experience, Tim is always interested in learning about new trends in the culinary field. Tim holds a Bachelor’s Degree in Culinary Nutrition and an Associate’s Degree in Culinary Arts, both from Johnson and Wales University. Working with the Culinary Professionals at Umass is something that Tim is passionate about and looks forward to on a daily basis. 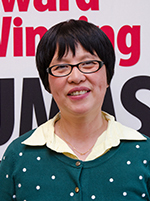 LuAnne Wu is an Assistant Manager at Worcester Dining Commons and has worked at UMass for two years. LuAnne previously worked as a Line Supervisor at Hampshire before being promoted to Assistant Manager at Worcester. LuAnne’s main responsibility is seeing that Worcester DC operations run smoothly and efficiently. She oversees all the students and staff that work at the dining commons. Outside of work, LuAnne enjoys spending her time with her family. She enjoys reading, playing piano and drawing with her one and four year old daughters. Her favorite thing about working at UMass is the people. She enjoys interacting with the awesome students and staff. David Kushi is the Assistant Manager of Worcester Dining Commons and oversees the ordering of all food and ingredients. David forecasts food needs on a daily basis for Worcester Dining Commons and UMass Special Events. 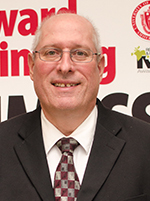 David received a Bachelor’s of Science in Business Administration from Western New England College. David has a wealth of experience working in the Food Service Industry. He has worked with UMass Dining for the past 14 years. In his spare time he enjoys being outdoors, gardening, landscaping, and hiking. His favorite UMass Dining Dish is Chicken Picatta. Selina Fournier is the Manager of Hampshire Dining Commons. 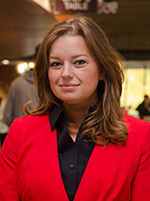 Selina’s main responsibilities at Hampshire include the hiring of student workers, managing student employees, training new hires, and implementing the rules and polices of Hampshire DC. In order to keep an efficient dining room, she creates new food stations, and focuses on maintaining high-level customer satisfaction using the expertise she gained from her background in the hospitality industry. She wants her students to enjoy trying new foods from different cultures while making smart choices that are SPE certified. She enjoys hosting special events and watching her 300 student employees succeed in their work. Keren Yu is an Assistant Manager at Hampshire DC. Keren has been working at UMass since 1995 and has held various positions throughout UMass Auxiliary Services. Keren began working as a line lady and worked several positions, including a DC chef, before becoming assistant manager. Keren is responsible for supervising day-to-day operations, the various kitchen lines, and the students and staff at Hampshire. She is also responsible for overseeing the menus and recipes, as well as coordinating special dietary needs for students. Keren enjoys working in her beautiful garden where she has many Chinese vegetables, flowers and plants. 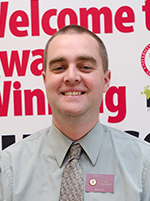 Pete Allard is the Assistant Manager of Hampshire Dining Commons. Pete is responsible for overseeing day-to-day operations in the Dining Commons and maintaining the highest possible standards. 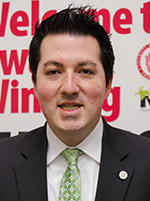 He brings to UMass over 8 years’ experience in Restaurant Management. Pete received his Bachelors of Science in Business Administration with a concentration in Accounting from Stonehill College. 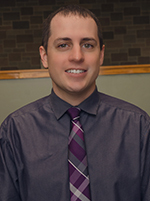 He joined our team in 2013 and really enjoys working with the students and staff. In his free time, he enjoys running, reading and spending time with his family. 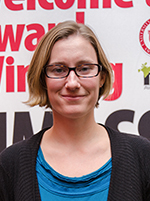 Heather Scoble is the Interim Manager of Berkshire Dining Commons. She is responsible for overseeing operations and directing staff to ensure the highest quality service. Heather has a passion for hospitality. She finds providing people with extraordinary experiences most rewarding. With a background in events management, Heather takes pride in organizing and staging special functions. She also enjoys educating students about healthy, sustainable, and fresh cuisine. In her free time, you can find Heather spending time with loved ones, antiquing, decorating, painting, and playing with her chocolate lab. 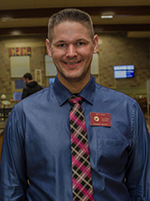 Marc Morrissette is the Manager of the Franklin Dining Commons. As manager of Franklin, Marc’s responsibilities include the hiring and management of personnel, maintaining inventory, implementing the menu, and taking care of Franklin’s customers. Outside of Franklin Dining Commons, Marc likes to hit the links and practice his golf game. Tim Lane is the Operations Manager of Franklin Dining Commons. With over 10 years of UMass Dining experience, Tim previously worked at Berkshire Dining Commons as well as the Worcester Dining Commons. As an Operations Manager, Tim manages the ordering for the Franklin Dining Commons and oversees DC operations alongside the manager, Marc. When he isn’t in the office, Tim enjoys running and kayaking. Alina Carcea is the Interim Associate Director of Retail Food Service at Auxiliary Enterprises. With a degree in Economics and Hospitality and an MBA from Harding University, Alina comes to us originally from Romania. She previously worked as Director of UMass Catering for two years before transitioning into her current role. Alina's catering and food service experience spans back to 2005. She plays a critical role in maintaining the financial and operational health of our retail dining locations. When Alina is not at work, she enjoys reading, running with her daughter while she’s riding her bike, and hiking with her family. Lynn Pelkey joins the team at Berkshire Dining Commons as the Assistant Manager. Lynn is responsible for overseeing the day-to-day operations at Berkshire Dining Common which focuses on Healthy Eating, Sustainability, World Flavors and Community. 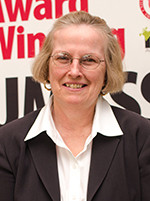 Lynn brings with her 35 years of Food Service Management experience and is excited to join the dynamic team at UMASS. Lynn received her Bachelors of Science from UMASS Amherst. In her free time she enjoys being with her family, friends and her beloved dog, Denali. Tunde Gyorgy is the Assistant Manager of Retail Dining Services and has been with UMass Dining for two years. Tunde is responsible for overseeing several dining locations throughout the Campus Center, such as Blue Wall, The Hatch, and many commercial cafes throughout campus. Her responsibilities include overseeing employees, and food operations for each dining location. Outside of work, Tunde enjoys traveling and experiencing new cultures. For example, Tunde enjoyed living in Paris for 5 months, where she learned about the Parisian culture. Other than traveling, she said she loves to hang out with friends and family and loves being surrounded by people. Adrienne Kaio, Retail Dining Manager for UMass Dining since 2010. 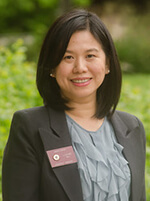 Alumnus of UMass Amherst, graduated with a degree in Hospitality Management. (She actually worked at Berkshire Dining when she was a student!) Previous experience includes General Manager with 99 Restaurants. When not working she enjoys time with her 2 boys, being outside, all beaches and cooking. 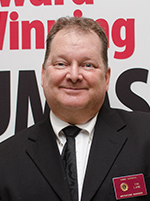 Paul MacGregor is the Retail Manager for UMass Amherst. 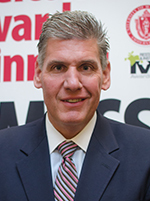 Paul came to UMass in 1996 as a Sports Management Major. His freshman year he started as a cashier in the Mullins Center and by his senior year Paul was an assistant manager. Upon graduation, he was offered a full time position to run the concessions for UMass events. From the experience he gained as a student employee, he enjoys working with students and leads by the example that hard work can pay off. When he is not working, he enjoys spending time with his 2 young sons and watching them hit homeruns over the Green Monster in his replicated Fenway Park back yard. Stephanie Stacey is the Assistant Retail Food Service Manager for UMass Dining. Her roles and responsibilities include managing the various coffee shops and cafes across campus including the new Roots Café in the Commonwealth Honors College and retail markets. Stephanie is an alumnus of UMass, and graduated with a degree in Hospitality and Tourism Management from the Isenberg School of Management. Her previous experience includes working as the Assistant Manager for several Starbucks locations in Western Massachusetts and as a Department Manager for Big Y World Class Markets. Her hobbies include snowboarding, playing ultimate Frisbee, and being outdoors. Simon Stevenson is the Bake Shop Manager and Pastry Chef for UMass Dining, overseeing production and distribution of all baked good on the UMass- Amherst campus. Simon is originally from England and has over 20 years of experience as a Pastry Chef. 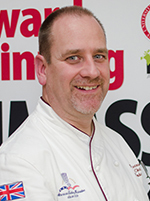 Simon attended Johnson and Wales University and served as Head of the Bakery Department at the Connecticut Culinary Institute. Simon has won 3 Gold Medals and 1 Silver Medal from the American Culinary Federation. Simon has produced educational segments for the T.V Show “Connecting Point” on WGBY where he promotes healthy baking and healthy eating. Simon enjoys reading, gardening, cooking, and traveling. 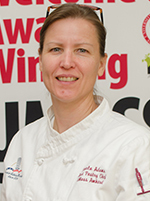 Pamela Adams is the Assistant Manager and Assistant Pastry Chef for UMass Dining. Pamela assists the Bakeshop Manager in the supervision of staff and managing the bakery operations. Pamela creates recipes and dessert menus for the Dining Commons as well as some Retail outlets. She also researches new products, ingredients, and food trends. Pamela received a Culinary Arts Certificate from the Connecticut Culinary Institute and she is also a UMass graduate. She has over 15 years of experience as a pastry culinarian, having at one point, owned her own small bakery in the Caribbean and worked for the Ritz Carlton. 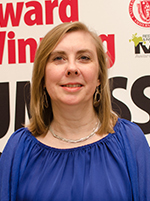 Pamela has represented UMass Dining in team competition both in the United States and in Canada, being the recipient of 3 gold, 1 silver and 1 bronze medals. Nationally, she competed individually in the Commercial Category for the 5th Annual America’s Best Raisin Bread Contest and was awarded Grand Prize Winner for her Cinnamon Swirl Raisin Bread in 2012. Pamela enjoys painting, kayaking, riding motorcycles, cooking, and spending time outdoors. 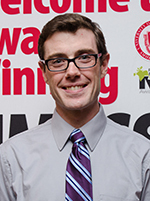 David Eichstaedt graduated with his MBA from the Isenberg School of Management in 2009. 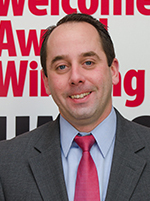 Prior to joining UMass Amherst, Eichstaedt was employed as a regional manager for the Compass Group in the national accounts division and until recently he was the Director of Retail Dining Service Auxiliary Enterprises at UMass Amherst.